Chuyun Oh: What were some of the questions you want to explore when you first decided to write a book on K-pop, and what aspects of K-pop drew your attention as a theatre/performance studies scholar? Suk-Young Kim: The primary questions I wanted to explore were twofold. How was it possible for a small country like South Korea to reinvent itself from a culturally obscure place to a pop culture powerhouse in just two decades or so? When I came to the US for my graduate studies in the late 90s, most American students did not know anything about South Korean culture. Today, most of my undergraduate students either follow K-pop or know something about it. How was this transformation possible? I was also concerned about our craving for liveness. K-pop’s natural habitat is YouTube and most K-pop stars and their performances can be found online. But why do fans still crave live concerts and live interaction with their idols? What is the driving force behind this constant search for a face-to-face interaction? Chuyun Oh: Would you like to give a heads-up to your future readers about what “live” and “liveness” mean to you, and why it matters to understand K-pop today? Suk-Young Kim: On a primary level, liveness indicates co-presence in time and space, where performers and spectators are situated in the same venue in real time. But the way I articulate the notion of liveness in this book goes far beyond the level of co-presence. Ultimately, it is about feeling connected to a broader community and sharing affective kinship with that community to the point that it reaffirms one’s feeling of liveliness and a sense of being alive in this increasingly mediated world. K-pop presents an interesting case in point since it both manipulates such affective kinship for monetary gain while also allowing for the genuine grassroots level communities and networks to emerge in a powerful way. Chuyun Oh: As beautifully demonstrated in your book, K-pop — including its representation, transnational circulation, and consumption — would be impossible today without hyper-sensory, mediatized technology. Still, at the same time, K-pop provides highly embodied and participatory platforms and experiences to both fans and K-pop performers. Ontologically and perhaps, aesthetically too, can you tell us a little more about how your project blurs the dichotomy between the liveliness of the body and the virtual world of the high-speed Internet? Suk-Young Kim: This is a terrific question. My chapter on hologram addresses this point most viscerally, but to tease out my main arguments here: K-pop as a cultural scene appears to be extravagant and excessive in its performance style, but if you look deeper into the K-Pop scene, its economy is fueled by the concept of scarcity or lack. The mediated images of K-pop idols saturate media space, and yet so few fans have seen them in close proximity. The lack of opportunities to see stars’ living bodies in real time and space is what creates constant thirst for their immediate presence, and that thirst has to be quenched by a compensating mechanism, which is to saturate our visual playing field with more and more mediated images. This constant gap between fan’s desire and the reality (to paraphrase, the gap between the real body and the mediated images of that body) is what fuels the K-pop craze. Chuyun Oh: Digital consumerism is often driven by and thus, inseparable from personally and/or socioculturally constructed desire. Why does K-pop matter to its consumers and fans, and what would be the desire lies behind K-pop consumption to this technology-savvy generation? 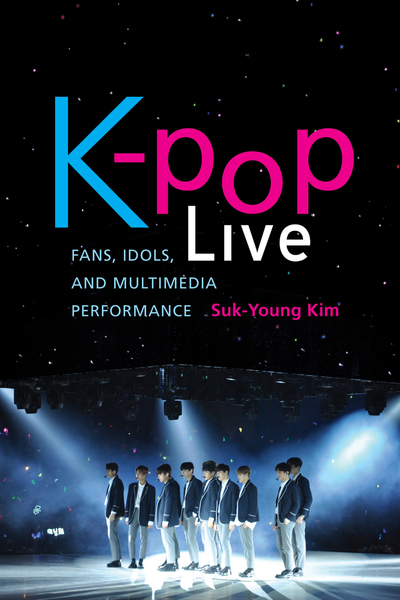 Suk-Young Kim: If I were to address this question by focusing on fan communities rather than fan-to-star dynamics, digitally savvy K-Pop fans have found ways to create a community of their own by establishing global networks online. K-pop fan clubs are extremely active online, using their participatory power to not only support their stars, but also establish kinship and share a sense of belonging that offline space does not willingly provide. Participation in online fan clubs can make fans overcome geographic distance and bring someone in Brazil and Iceland into an intimate interaction by sharing their common passion. A sense of belonging, in this case, stems from a sense of validation by others. But I would be remiss not to mention how this fan community, for some fans, is also used as a place to promote themselves and create distinction for themselves by demonstrating their close association with the stars (the so-called “fame by association”). Many K-pop fan clubs have a strict hierarchy that resembles a military organization (the longer you’ve been around and the more material support you’ve provided for their stars, the higher your status will be in fan clubs). K-pop industry navigates through this double edged fandom by promoting both hyperconsummerism and a sense of belonging. Another way to address this question is to see how K-pop itself celebrates technological trendiness. K-pop creates desire for something newer, faster, smarter with their never-ceasing production line, just like smartphone companies are pressured to pump out new models that will be better than the previous version. I think being associated with the K-pop scene directly translates into performing one’s tech-savviness and trendiness.